In the words of my 11-year-old, "The best time ever!" We have all been there. We'd like to create memories for our kids, encourage them to want to spend quality time with us, and get off their phones. But how many game and movie nights can we do without all of us saying, this is so boring! What can I do with them that would be exciting enough to compete with Snapchat or Facebook? What could I do with them, that would be engaging and fun enough that they might actually be present and want to participate, rather than just take pictures of what they were "supposed to be doing" on their phone? I can't tell you how many times I have seen my kids getting together to do something fun with their friends, only to see them posing for pictures, but really doing nothing. I jokingly asked my daughter one day, "so does everyone just pose for pictures to make it look like they are having fun, when in reality they are just posing for pictures and doing nothing?" "Yes", she said, "Of course that's what we are doing...that's what everyone does." It was sad. Our kids are not living in the moment anymore. They are so busy posing and taking pictures, that they don't actively participate in making real memories. Then one day after witnessing another round of selfies, I decided that I had a mission. I was going to think of something to do with my kids, that would be so new, so exciting, so engaging that they would finally be busy doing and enjoying, rather than documenting with an iPhone. But what in the world was I going to do? Even at a recent concert we attended, it was watched primarily through the lens as it was snapchatted, Facebooked, Instagramed. We were headed to Los Angeles in a few weeks, so I knew it would be a good opportunity to try and do something outside our comfort zone. But what would be different there? Going to a museum or studio tour would most likely encourage the iPhone use. I needed to find something for them to do that would force them to put the iPhone down. So, as I browsed my Facebook feed and went to like another incredibly gorgeous floral display done by Jeff Leatham, whose work I so admire, it came to me! Jeff just opened a studio in LA. What if, by some stroke of luck, he would be there when we were, and what if he would be willing to share some of his genius with us? The chances of something this incredible working out seemed slim to none, but I had to try. After a little research, and a few emails, I connected with Emily, Jeff's personal assistant. She immediately asked Jeff if he would consider doing a private class for us, and although he hadn't done one for a small group before (his classes are usually for about 400 people at a time) he was game and excited to do it. We coordinated our schedules and that was it! I told the girls that I had something really cool planned for them. "What are we doing they both yelled? Studio tour? Shopping? Museum? " I told them that we were going to have a private floral design class with Jeff Leatham. At first I thought, I hope this goes over well, but then realized, "what was I thinking?" 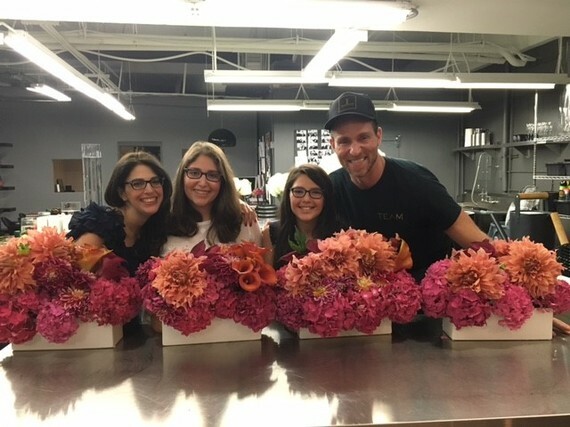 Jeff designs the most incredible flowers for the Kardashians, and that was something I knew my girls would know. They not only knew of Jeff on the show, they knew about his design work and his talent...they were ecstatic. It had been a very long time since I heard my kids say that they couldn't wait to do something, or that they were so excited to learn something new. They were looking forward to meeting Jeff, but not because of his Kardashian fame, but for the cool tricks he could teach them about making flowers look as if they were floating on air, or his famous technique of balancing a bunch of flowers so that they looked as if they might tip over at any moment, but never do. When the day finally came to meet Jeff, the kids had "ants in their pants." They literally asked me every hour, if they should start getting ready to go, and would I be out of my meeting in time so we wouldn't be late. When we arrived at the studio it was amazing. Jeff welcomed us all, as if we were old friends, and made the girls comfortable immediately. He is not only one of the most talented people I have ever met, he's also one of the warmest and kindest. He brought out vase after vase, and one incredible flower after the next for us to learn about and create with. He taught us so many wonderful things not only about arranging the flowers, but about the varieties and care of each as well. One of the things I noticed immediately was that both of my girls phones were left on the table and it was I who finally said, "Oh my goodness, we need to get some pictures!." The kids didn't want any part of the phones, they were much too busy designing, learning, laughing, asking questions, and most of all, doing! The time we spent with Jeff just flew and by the time we were done, we not only had 9 arrangements to give away, we had memories of a lifetime, and I think a new friend as well. The girls are still stuck to their phones, however, every few months, or for special holidays, we go out and bring in a bunch of flowers. We put the phones away and spend time together, talking about the fun time we had in our flower class, and laughing at our "sometimes" sad attempt to replicate some of the techniques we learned from Jeff. So, do you need to do something so spectacular to get your kids to put the phone down and appreciate the time you spend with them? Absolutely not! But if you take anything away from reading this, it's this. Put the game and pizza night on the back burner for a while and try to do something a little different, something that forces you all to be engaged. Take a cooking class, find a local place to make pottery or paint, ask your local florist if they offer any classes, buy some art supplies and make something at home. Pizza and Game night are awesome, but every now and then, think out of the "Flower Box!"